Valley Baptist Health Insurance Company is a locally owned and operated health insurance company servicing the Rio Grande Valley in the state of Texas. They are an affiliate of Valley Baptist Health Systems and serve businesses of all sizes. Valley Baptist prides itself on having a unique relationship with its clients, being a local company that understands the health needs of the region. Find health insurance in your region of the country. Click here and enter your zip code to begin your search with a list of policies and rate quotes from local health insurance providers. Valley Baptist Health Insurance Company is a subsidiary of Valley Baptist Health Systems, which is a Christian nonprofit community health service operating two major hospitals in the region in Brownsville and Harlingen. These hospitals trace their roots back to the very early 20th century. The health insurance company was founded in 1995. It is currently led by president and Chief Executive Officer, James E. Eastham. Among its largest and most well known clients includes the Teachers Retirement Board of Texas. Valley Baptist Health Insurance Company only services the counties of Hidalgo, Cameron, Willacy, and a portion of Starr in the state of Texas. They do not cover areas outside of these counties or outside of Texas. If you have a dependent living elsewhere in Texas, you can find a provider for them that will be covered through the Texas True Choice Network. If your dependent is residing outside of Texas, you must call customer service to locate a medical provider. 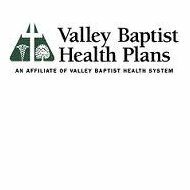 Valley Baptist Health Insurance Company offers an HMO insurance plan and a PPO insurance Plan. An HMO, or Health Maintenance Organization, covers medical services rendered by a physician on a preferred network list of providers. Patients with this type of insurance cannot see a provider outside the network or these services will not be covered by insurance. A PPO, or Preferred Provider Organization, is an insurance plan where clients receive a reduced rate for using a provider in the preferred network. Clients normally have to pay a co-pay at the time services are rendered but they have more flexibility in terms of the medical providers they can use. Network provider listings for both the HMO and PPO plans are listed on Valley Baptist’s website. The company requires that all clients designate a primary care physician regardless of which plan they have. Valley Baptist Health Insurance Company has a received a rating of B (fair), as of December 2010, from A.M. Best. This rating is because, while the company is currently stable, their long-term financial outlook is negative. A.M. Best feels that their financial obligations may not be able to be met in the near future. Despite this less favorable rating, Valley Baptist Health Insurance Company has received a 95% customer satisfaction rating from their clients. The source of this rating information was not available. Additionally, the Better Business Bureau gives Valley Baptist Health Insurance an A+ rating based on the length of time they have been in business, their complaint volume compared to other companies of their size, and their handling and response to the one and only complaint that was filed against the company in the past year. Start searching for health insurance in your area by getting a list of rate quotes. Simply click here and enter your zip code for a list of quotes from health insurance providers in your area.